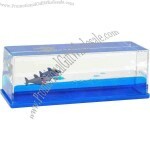 Liquid wave paperweight with floating sharks. Liquid motion products are always fun, entertaining and perfect for promotional giveaways. Your customized company's logo or slogan on this paperweight makes the perfect gift for your clients at your next trade show or event. 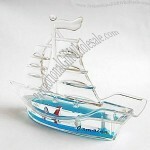 The shape can be your own design,and customized 3D resin floater. Unique attractive appearance, set for the integration of utility and ornamental, rich color water and floating objects. The first choice for gifts or promotional advertising, can change anything based on customer requirements,can set or print advertisement on colored water or floating objects. Ornamental for family, safe, tasteless, security. Changing water level in the neck predicts the weather. We think they are more accurate than your local weather man! Includes instructions. Available in blue, teal, pink, red, green, yellow and purple. The Weatherball quickly indicates any changes in atmospheric pressure. The air trapped by the liquid maintains a steady pressure. When high pressure and good weather are approaching, the liquid is pushed down the spout. When low pressure and bad weather invade your region greater pressure trapped inside the Weatherball causes the liquid in the spout to rise. If liquid spills out of the top you should take shelter! Custom-made Liquid Craft From China Factory, Low price Liquid Craft, Top Quality, True wholesale source for original!